Godzilla: Monster of Monsters! 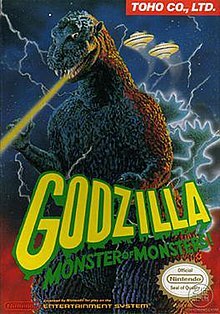 (ゴジラ) is a Nintendo Entertainment System video game released in the US in 1988 by Toho Co., Ltd. The North American version removes all references about Toho Cenfile-Soft Library and Compile, crediting the game to Toho Eizo on the title screen instead. The mysterious Planet X appears when Pluto and Neptune switch positions in the solar system, and its inhabitants begin an attempt to conquer the Earth, using a legion of space monsters (though some of these creatures were in fact from Earth) as their primary attack force. The King of Monsters, Godzilla, joins forces with the guardian monster Mothra and the forces of Earth to repel the invasion forces. Mothra trying to defeat Manda, a monster that emerges from the Martian volcanoes. The game features two playable characters, Godzilla and Mothra (who originally appeared in her own movie and then later became a regular monster to fight alongside Godzilla). The player uses both monsters in turn by selecting the desired character on a virtual gameboard, representative of the planet it is on, and moving it like a chess piece. Each space is a hexagon that represents playable, side-scrolling levels. There are rocky zones, jungle zones, city zones, and hyperspace zones. The hyperspace zones feature fights with the Matango, Dogora, and the Goten. The alien space ships resemble the design of Atragon and The War in Space. Each board contains several monsters from the Godzilla series and some from other Toho movies and the objective is to clear each board of enemy monsters before advancing to the next board. Battles are fought when the player moves Godzilla or Mothra adjacent to an enemy monster, and are reminiscent of a match from a fighting game. The player plays a small side-scrolling level for each space advanced, and if one has moved adjacent to the monster, a battle follows the side-scrolling stages. More monsters appear on each stage until nearly every monster in the game is featured. When the player reaches Planet X, every previous monster is present along with King Ghidorah himself. The monster battles have a time limit of forty seconds but lack a countdown timer. The titular mushroom kaiju from the 1963 film Matango appear as mid-bosses throughout the early stages of the game. In later stages, that role goes to Gohten, the space battleship ship from the 1977 sci-fi film The War in Space. Also, Dogora from the 1964 film of the same name and the creature Manda from the 1963 film Atragon appear as common enemies throughout the game. Later, a sequel was made called Godzilla 2: War of the Monsters. The player controls the Army, trying to protect Japan from the Godzilla characters.